"It is a truth universally acknowledged that a single man in possession of a good fortune must be in want of a wife." 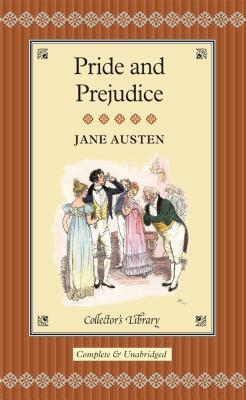 Few novels have as passionate a following as Jane Austen's witty, perceptive tale of five sisters and their quest for marriage. When Elizabeth Bennett overhears the proud and arrogant Darcy insulting her, she develops a stubborn and blinding prejudice against hima prejudice that may harm her family and her very chances for happiness. A sparkling satire with serious undertones that explores manners, motives, and society. The world's greatest works of literature are now available in these beautiful keepsake volumes. Bound in real cloth, and featuring gilt edges and ribbon markers, these beautifully produced books are a wonderful way to build a handsome library of classic literature. These are the essential novels that belong in every home. They'll transport readers to imaginary worlds and provide excitement, entertainment, and enlightenment for years to come. All of these novels feature attractive illustrations and have an unequalled period feel that will grace the library, the bedside table or bureau.